Wash & chop the chicken breast to small pieces. Wash & chop the spinach. Put a pan on slow flame, add ginger and garlic paste. Add chopped spring onions. Stir for a few minutes. 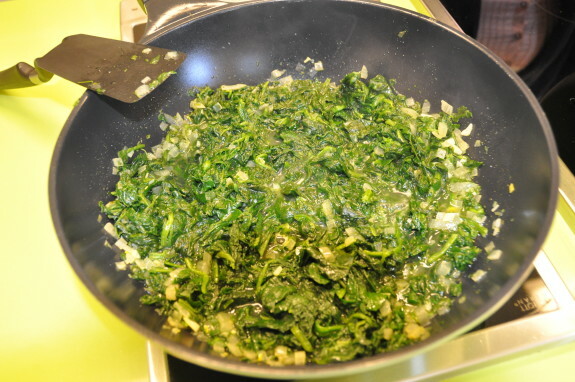 Add spinach and allow to cook for another 2-3 minutes with the lid on the pan. Add the chicken (shredded into small pieces). Add spices: turmeric, rock salt, coriander powder, garam masala, red chilli powder. (May even add a green chili if fond of spices). Allow to cook for 20-25 minutes on slow flame. (In case using a pressure cooker- you may allow 2 whistles and then let it be on slow flame for 5 minutes).